Amery House - Summerstrand Accommodation. Our newly refurbished Tuscan Villa situated in the heart of Summerstrand, Port Elizabeth has been particularly designed with the traveller at heart. Tastefully decorated with unexpected large rooms gives the traveller a feeling of peace and tranquillity, spaciousness coupled with views of vast open bushlands with the sounds of birdlife to waken you. 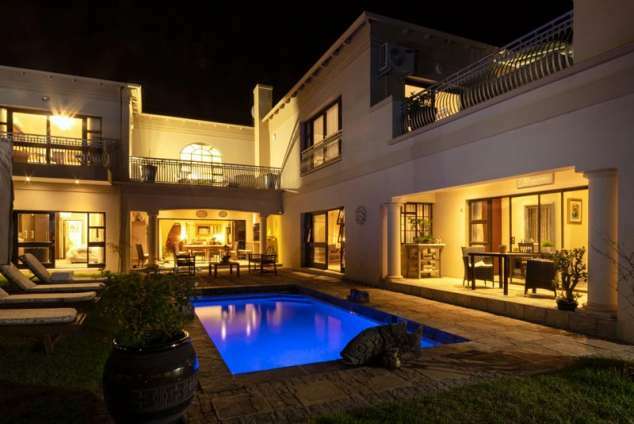 Situated just a mere 5 minutes to all the restaurants, the Boardwalk, and Casino, and within an easy 10-minute reach of Port Elizabeth Airport. The Nelson Mandela University is within an easy 5 minutes drive. We arrange external transfer companies to do our transfers and have a full travel desk to assist clients. Peaceful, warm and sunny. This comfortable room offers a king size bed, En-suite bathroom with shower and double vanity. All guest amenities and luxury crisp white linen, Gowns, slippers and Hairdryers are provided. In room Tea and Coffee facilities, Laptop, Safes, Plasma TV with DSTV bouquet, Air Conditioned. Enjoy one of the many lounges or join us at the pool patio. This Luxury spacious King room opens onto the garden and pool area, offering a king size bed. Read a book in the seated area while enjoying Tea or Coffee or refreshments from the Honesty bar. Crisp White linen, Gowns and Slippers. Plasma TV with DSTV Bouquet Laptop Safes and serviced daily. This luxury en-suite bathroom has a Shower and bath, carefully selected guest amenities and hairdryer provided. This wonderful cosy room is situated next to the pool, fitted with King Bed for Luxury. Crisp white linen, bathrobes and slippers. The en-suite room has a shower. True luxury is found in the Eco-friendly guest amenities, there for your enjoyment. Hairdryer, honesty bar and Plasma TV with DSTV bouquet. Tea and Coffee facilities. Private balcony for early morning enjoyment and fully serviced daily. Private entrance. This Large Family room offers comfort and is tastefully decorated for the discerning guest. Overlooking the vast untouched bush lands, it gives you a sense of Africa. The room offers 2 king beds, Crisp Percale Linen, bathrobes to match and slippers. A spacious bathroom with a walk-in skylight rain shower. The free-standing bath is a feature of the room. Our Guest amenities are endorsed by beauty without cruelty. Honest bar, Tea and Coffee Facilities, Plasma TV with DSTV bouquet. Large Balcony to enjoy sundowners and views over the bushveld or relax on the sun loungers while having a family barbeque. This spacious Luxury en-suite is fitted with a king bed. Fresh white linen, gowns and slippers are provided. It has its own private lounge area or you can enjoy the sunny cosy guest lounge. The bathroom with its guest amenities which are pleasing to the senses and is environmentally friendly, Air conditioned, honesty bar, Tea and Coffee facilities, Flat screen TV with DSTV bouquet and serviced daily. This Presidential suite, boast 2 King size beds, Crisp white linen, gowns and slippers. Decorated with lavishness it lends itself to the family travellers or Honeymooners alike. A bridal suite for the bride to be and her bride’s maids accommodated in the nearby rooms. The en-suite bathroom is breathtaking with bath and walk-in shower and dressing room. Enjoy our Keet and Monks Guest amenity range with its refreshing, unique and exhilarating scents of Avo and Cucumber. In room Tea and Coffee Facilities, honesty bar. Plasma TV with DSTV bouquet and serviced daily. From Port Elizabeth Airport head North On Airport West Road. At the roundabout take the 3rd exit and stay on Allister Miller Drive. At the next roundabout take the first exist and stay on Allister Miller Drive. Allister Miller drive will continue and become La Roche drive. Take a right turn into Strandfontein Road. At the next roundabout take the 3rd exit onto Admiralty Way. Turn left into Alashan Road. Take the first right into Amery Crescent. Continue straight ahead and we will be right in front of you. 138 page views since 20 Nov, 2018. Last updated on 22 Nov, 2018.